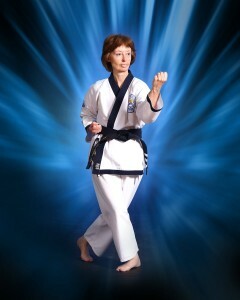 Helen Bagnall Jo Kyo Nim started attending Camas Soo Bahk Do in 1998, when it was “Camas Karate” and operated a studio near the Post Office on 5th Street in downtown Camas. She was 45 years old. While watching her son take the classes, she thought this was something she could try too. He moved on to other activities, but she stuck with it. Bagnall Jo Kyo Nim was also the director of our “Yong Gi” class – specializing in Soo Bahk Do training for 3 to 6-year-old members. Helen also likes to run and walk, baby-sit her grandchildren, garden, read, and work on hand stitching projects.